Donald Trump's scandal-ridden EPA administrator, Scott Pruitt, has resigned in the wake of multiple legal and ethical issues. Mr. Trump announced the resignation in a tweet on Thursday in which he thanked Mr. Pruitt for an “outstanding job” and said the agency’s deputy, Andrew Wheeler, would take over as the acting administrator on Monday. Mr. Pruitt had been hailed as a hero among conservatives for his zealous deregulation, but he could not overcome the stain of numerous ethics questions about his alleged spending abuses, first-class travel and cozy relationships with lobbyists. 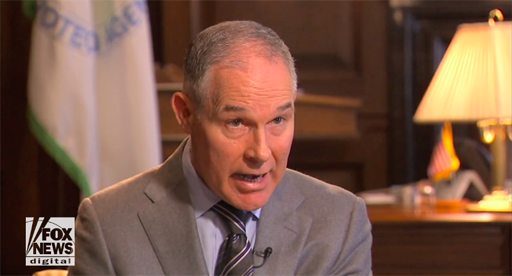 Earlier on Thursday, The New York Times reported on new questions about whether aides to Mr. Pruitt had deleted sensitive information about his meetings from his public schedule, potentially in violation of the law. President Trump: "I have accepted the resignation of Scott Pruitt as the Administrator of the Environmental Protection Agency. Within the Agency Scott has done an outstanding job, and I will always be thankful to him for this." The best reaction, though, of the news comes from the mother who confronted Pruitt just days ago in a D.C. restaurant. After listing his many scandals, she asked him to resign before being forced out. And today he did. So the mother took to Twitter with a new message figuring if it worked once, maybe...? Hey @realDonaldTrump where are you going to lunch tomorrow?